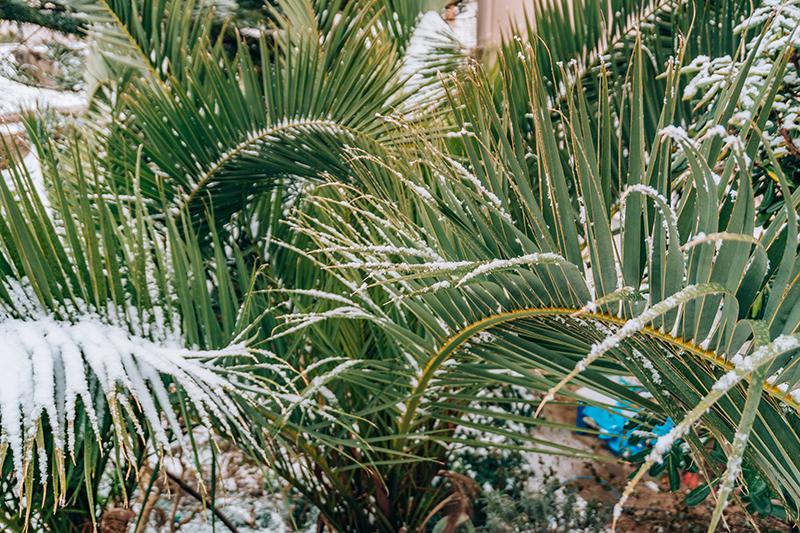 In Florida, winter temperatures can occasionally dip low enough to cause damage to certain plants and trees. This is especially true in Northeast Florida, where we see some of the coolest conditions in the state. Subtropical and tropical trees are at risk of cold injury, and some temperate plants and annuals are as well. TREECO, the premier tree company in St. Augustine, offers the following information to help you protect your trees before a cold front in Florida. How Does Cold Affect Trees? How well a tree withstands the cold has a lot to do with temperature fluctuations. A tree is better able to acclimate to the cold if temperatures gradually decrease over time. When a sudden cold front moves in after warm temperatures, it’s more likely to cause cold damage to trees and plants. The cold injury may impact the entire tree, or only certain parts including the trunk, bark, fruits, roots, leaves or branches. While some parts of the tree can acclimate to the cold, parts such as roots, flowers, and fruits don’t adapt well. Certain citrus trees, flowering trees, and tropical and subtropical palms do not tolerate cold temperatures well. Temperatures below 45 degrees can already damage some tropical plants. Frosts occur at 32 degrees, and freezes occur below 30 degrees. These temperatures are the most devastating to certain trees and plants. They must be protected from the cold to avoid damage. A tree company in Jacksonville can advise you on which trees are the most cold-hardy in our area. Some examples include magnolias, loblolly bays, live oaks, long-leaf pines, and hollies. When you have subtropical or tropical trees and plants in your yard, make sure you take the steps to protect them. Here are some of the things you can do to avoid losing an integral part of your landscape. Avoid pruning trees in late summer and early fall. This could produce new growth that is more susceptible to cold injury. Check your trees for pests routinely. Trees that are healthy will be more resistant to cold than trees that have a disease or insect issues. Add a fresh layer of mulch around trees, especially the roots, before a cold front comes in. Move potted trees indoors or to a sheltered area if possible. If you must leave them outdoors, protect them with additional mulch and push them together against an exterior wall of your home. Thoroughly water your trees and plants the day before a cold front. The water can help to hold heat, and a watered tree will be more cold tolerant. Cover trees that are sensitive with sheets or fabric cover to protect them. Make sure the cover goes all the way to the ground to trap in radiant heat. Use rocks or stakes to secure them. Turn off your irrigation system before the freeze occurs. After a frost or freeze, check your tree’s water needs. Adding water can help with thawing and rehydrating the tree. Taking a few extra steps can help protect your trees from being damaged in a cold front. Contact the certified arborists at TREECO to learn more about keeping your trees healthy this winter. We serve the Jacksonville and St. Augustine areas. Call us at (904) 810-1033 to schedule an appointment.